The term "session IPA" is one that has seen its popularity grow and have its value debated in equal measure since first appearing on the scene. "Isn't it just a hoppier pale or a lower ABV IPA, in which case it's not an IPA?" is the typical starting point for any conversation. Indeed, there have been some examples in which the attempt to get more hops without the balancing malt and booze have led to beers deserving of debate, but the Bantam is one that seems likely to render any debate worthless. Why? Because it's delicious. At just 4.7 percent it's certainly outside any style guideline parameters for an IPA, but you wouldn't know as Jayne has managed to create a beer with the sort of palate-caressing mouthfeel that belies its strength. 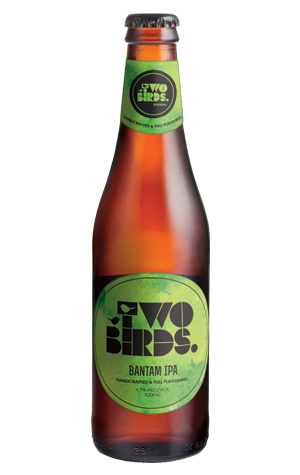 Given where it's come from it goes without saying that it's balanced, even though it's the beer in the Two Birds core lineup with the biggest character, both in terms of the punchy tropical fruit aromas that welcome you in and the caramel malts that give it its copper glow.